The markets on Sunday were crowded with mothers making special purchases for ‘Pua Jiuntia’. The festival celebrates the special bond between mother and the children. Monday will see mothers across Western Odisha fasting the whole day without water for the wellbeing of their children. Pua Jiuntia is a well known festival of Kosal or Western Orissa region. It is celebrated in every village and town of western Orissa in the month of Aswina. Pua Jiuntia is generally observed by mothers to invoke the grace of Lord “Dutibahana” for the long life and prosperity of their sons. 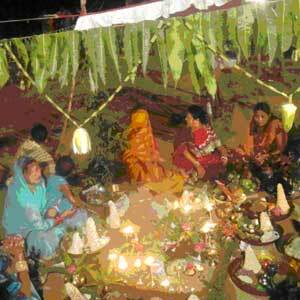 Mothers would worship Lord Dutibahana in an open space splendidly decorated with Aam Taran (mango leaves) and flowers. The offerings include 108 duba, 108 unbroken arua rice, the juinta (thread), jugar (made of puffed paddy) and tikhri (made of moong dal). After a holy dip in a nearby river or water body, the mother breaks her fast, the next the morning, after tying the juintia on the wrist of the children. She also prepares a special dish from 21 types of vegetables and fruits, as mentioned in the mythology.